ValhallaÜberMod, Other software modulation effect from Valhalla DSP. Valhalla DSP has released ValhallaÜberMod, a new multi-FX plug-in for 32- and 64-bit Windows and Mac OS X in VST, AU and RTAS plug-in formats. 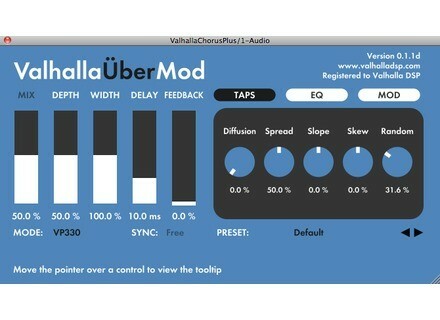 ValhallaÜberMod is a multitap delay and modulation plug-in. 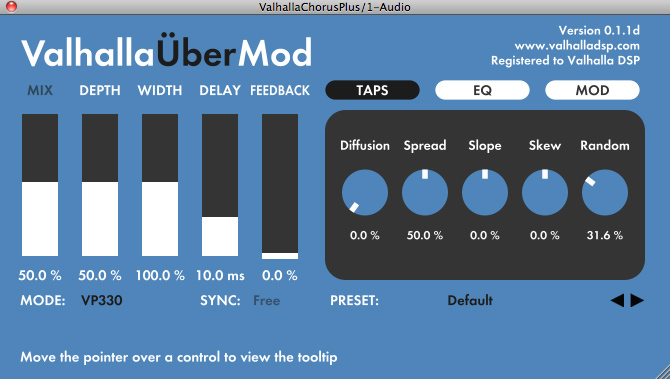 With up to 32 modulated delay taps, diffusion and overdrive sections, and parallel slow and vibrato LFOs, ÜberMod can be used to create lush dimensional choruses, classic string ensembles, tape and BBD echoes, non-linear and reverse reverbs, and various sounds that defy categorization, according to ValhallaDSP. True stereo signal path, for maintaining the spatial image of stereo inputs. Mono/stereo inputs, stereo outputs. Delay times that can be synced to tempo, to create modulated delays and non-linear reverbs at specific beat rates. WIDTH control, that varies the spatial image from mono to stereo to "super-stereo". Separate parameters for the detune and vibrato oscillators, to have control of up to 32 independent LFOs. A high level DEPTH parameter, for adjustments to the overall chorus modulation amount. A large number of chorus tap modes (2/4/6/8/16/32 Taps, Dual Ensemble, 16Phase) for dialling in specific chorus, ensemble, and non-linear reverb sounds. Diffusion section (with adjustable amount, size, mod width and mod depth) for creating delays that smear over time, diffusion choruses, and modulated reverbs. Drive section (with pre-gain, post-gain, and noise gain) for emulating tape saturation & analog delays. Taps menu, for adjusting the spacing, slope, left/right skew, and randomization of the output taps. A simple yet powerful EQ section, for rolling off the high and low frequencies, and switching between bright and dark color modes. SPEED control, to double the delay time and drop the pitch of the signal within the delay buffers. All parameter changes are smoothed to avoid clicks, and to generate tape echo-esque effects. The smoothing time can be adjusted to create a variety of swishing, whooshing boing sounds. Resizeable GUI influenced by NASA Human Interface specifications & Swiss School of graphic design. Controls have dedicated sliders, while the "tweakier" controls are selected via their own panels. Cross platform/DAW preset mechanism, that allows presets to be exchanged with other ÜberMod users via text based copy and paste. Chromaphone v1.0.1 Update Applied Acoustics Systems has updated Chromaphone. DruMM Modules Released Stretch That Note is proud to announce a range of seven Kontakt 3/4 compatible DruMM modules. Project SAM Orchestral Essentials ProjectSAM have released Orchestral Essentials, a Kontakt instrument for debuting film composers.